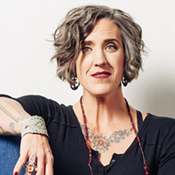 Bring a favorite Bible story, Rumi poem, Buddhist koan, Parable, or other spiritual text and spend a couple of hours with Nadia Bolz-Weber in a conversation and workshop around how the sacred can be the best illuminator of the profane and vice versa. Open to writers of all genres and levels. Stick around after the craft talk for a reading, reception, and Q&A with Bolz-Weber from 6:30 to 8:00 PM. Tattered Cover will be on-site to sell books. Register here.